Place of Death: Casselberry, Florida, U.S.
Hedy Lamarr was an Austrian and American actress and inventor. She was born in Vienna, the daughter of Emil Kiesler, from L’viv, then in the Habsburg Empire, now in Ukraine, and Gertrud “Trude” (Lichtwitz), who was born in Budapest, Hungary. Hedy’s parents were both born Jewish. Conflicting reports state that Hedy’s mother, Hedy herself, or both of them, later converted to Catholicism. 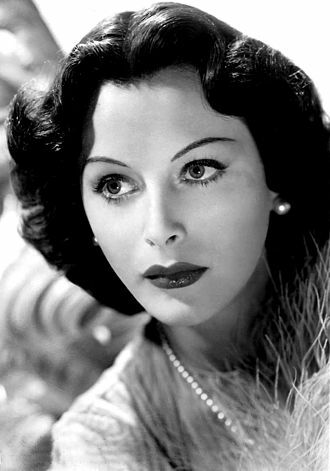 Hedy left Europe in the late 1930s to escape the Nazis. Hedy was a relative of architect, theoretician, theater designer, sculptor, and artist Frederick John Kiesler. She had a son with her former husband, screenwriter and producer Gene Markey, and two children with her former husband, actor John Loder. Hedy’s paternal grandfather was Osias Kiesler (the son of Rubin Kiesler and Chaja Sara Rosenthal). Osias was born in Kolomyya, Kolomyis’kyi district, Ivano-Frankivs’ka oblast, Ukraine. Hedy’s paternal grandmother was Taube Malke Katz-Auwerbach (the daughter of Samuel Aron Katz and Henne Gittel Auwerbach/Aberbach). Taube was born in Lviv, Lviv Oblast, Ukraine. Hedy’s maternal grandfather was Karoly/Carl Moritz Leopold Lichtwitz (the son of Salomon Lichtwitz and Johanna Goldscheider). Karoly was born in Troppau (Opava), Czech Republic. Salomon was the son of Bernardt Lichtwitz and Lena Gottlieb. Johanna was the daughter of Salomon Goldscheider and Friederike Königer. Hedy’s maternal grandmother was Rosa Joachim (the daughter of Moriz “Morris” Joachim and Sofie Ehrlich). Rosa was born in Vienna, Austria. Moriz was born in Slavkov u Brna, Vyškov District, South Moravian Region, the son of Jacob Joachim and Sara Kapperl. Sofie was born in Brtnice, Jihlava District, Vysocina Region, the daughter of Adam Friedländer Ehrlich and Veronika Friedländer Berstl.